Bb Learn Original currently requires you to select Item Analysis from a test's contextual menu (whether the test is deployed in a content area, listed on the 'Tests' page, or via the test's Grade Center column). 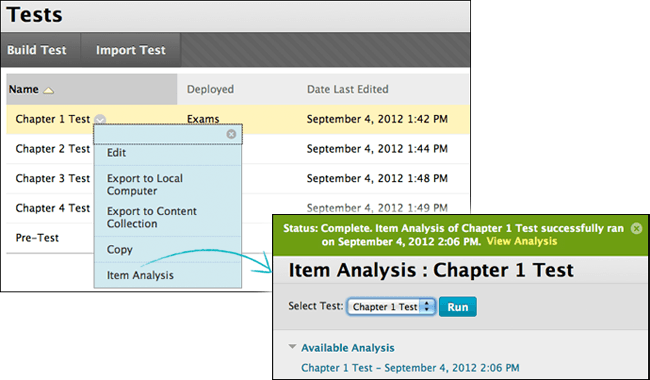 However, you are still required to select the test again from the 'Select Test' menu on Item Analysis page. I strongly feel that this is a redundant step, conflicts with seamless UI standards and one that can be definitely eliminated. If a user wants Item Analysis for specific test, why have the user select the same test again upon reaching the Item Analysis page? This page only lists statistics for a single test and so there is no added benefit of making Item Analysis a generic link in the test's contextual menu. Any takers on having this step removed for a better user experience? Likewise, how can we delete previous Item Analyses under 'Available Analysis' if the user wants to only display the most current test analysis?